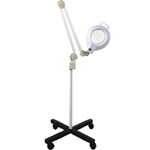 Facial lamps and magnifier lamps are important equipment in any salon and spa that offers different facial treatments. Source One Beauty carries both round and square with up to 5x diopter magnification. 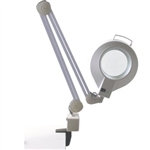 These facial lamps are either available with a heavy base and a 360 degree swivel arm or a table clip for stationary use. Certain types of facial lamp are used in tanning beds. These facial lamps are designed to use reflectors to give the client's face optimal exposure to the ultraviolet rays from the tanning bed. 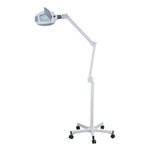 Also, take advantage of our infrared lamps, woods lamps and skin scanners.